You can either serve the meat on the bone as we have done here or you could pull it off the bone while it is warm or serve it like that. 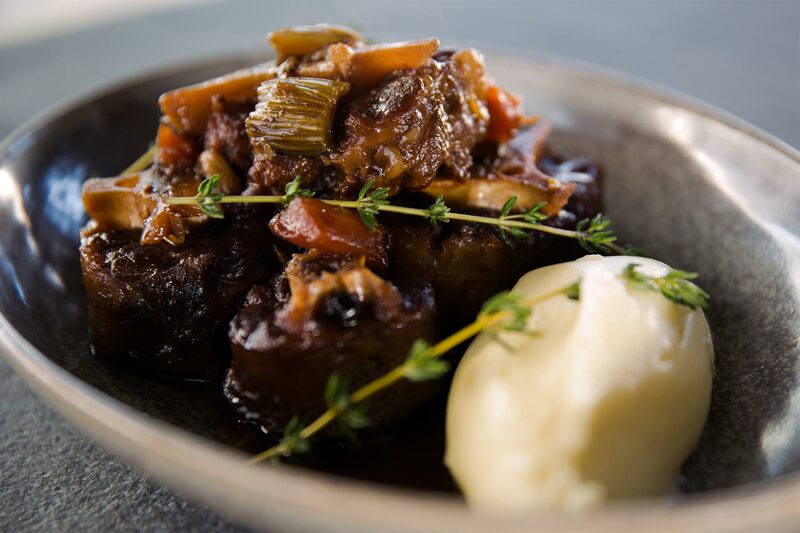 Add a splash of red wine vinegar to the sauce to sharpen it up at the end as well, which will help cut through the rich fattiness of the oxtail. Peel and then place the potatoes in a pot of cold water, season with salt and bring to a boil, cook until tender. Cool to room temperature, remove the meat and vegetables, put the liquid back on the heat and reduce to a nice sauce consistency, normally about by half, then add the meat and vegetables back in. Heat the cream and butter and pour over the mash and stir in with a wooden spoon. Season to taste and serve with the ox tail.